Starting Today contains 100 poems written during—and responding to—Barack Obama’s first 100 days in office. 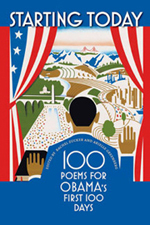 The poems included in this anthology, except for Elizabeth Alexander’s inauguration poem, were all written no more than a day before they appeared on the popular blog, “Starting Today: Poems for the First 100 Days”. The result is a work that documents the political and personal events of those crucial days through a variety of contemporary poetic voices, from the ebullient to the admiring, from the pithy to the loquacious. Difficult to categorize but easy to enjoy, the poems in Starting Today offer something for every type of poetry reader, from the novice to the seasoned. This smart, timely collection offers a swirling portrait of the American Zeitgeist—a poetic reportage that demonstrates spontaneity, collaboration, immediacy, and accessibility.